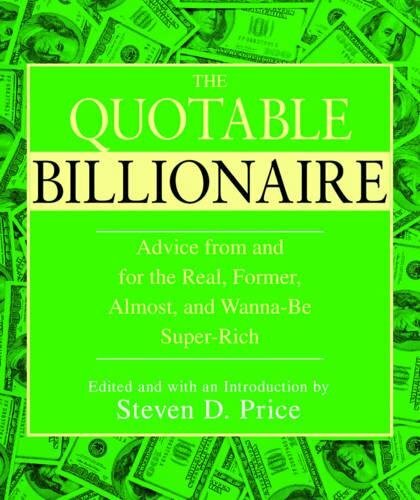 What the super-rich and others have to say about money in these pages is sometimes enlightening, sometimes profound, often entertaining, and always revealing. Topics include wealth (If you can actually count your money, then you are not really a rich man.”J. Paul Getty); investing (Only buy something that you’d be perfectly happy to hold if the market shut down for ten years.”Warren Buffett); success (The secret of success is to do common things uncommonly well.”John D. Rockefeller); and leadership (The buck stops with the guy who signs the checks.”Rupert Murdoch). In addition are proverbs, quips, and other commentary on all aspects of having a fortune.